Cumbernauld Colts maintained their perfect start to the season when a spectacular Sean Brown strike settled their match with Selkirk at Broadwood on Saturday. 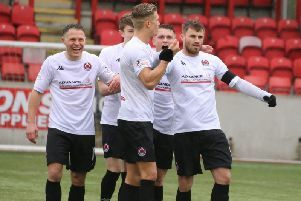 Brown’s goal - the only one of the match - made it three wins out of three for Colts and left them second top of the Lowland League table, behind Spartans only on goal difference. Selkirk went into Saturday’s match top of the table after also winning their opening twoi fixtures and in an even first half their improvement over the last six months under new manager Ian Fergus was evident. Chances were few and far between in the opening stages as both sides enjoyed spells in possession but it was Colts who looked more likely to create an opportunity in the first period. As the half progressed both teams had chances through on goal but goalkeepers Sam George and Gregor Amos refused to be beaten and the sides went into half-time level at 0-0. Colts introduced Fraser Sheridan at half-time in order to add more pace and creativity to their attack. There was not much between the two teams but again it was Colts who looked more likely to score with Sheridan and Stephen O’Neill supporting Brown up front. The visitors however were not without their chances; George was called into action on two occasions to make importance saves to his left hand side, holding on to the ball well. The opening goal came five minutes from time as Colts were awarded a free-kick five yards inside their own half. Stephen Kerr played a long ball into the Selkirk box which Brown was able to control on his chest and catch the keeper off guard with an overhead kick worthy of winning any match, put Colts into the lead with time running out. Colts managed to keep hold of the one goal advantage until the final whistle claiming three points and moving up to second place in the league. Next up on Saturday is a trip to play last season’s champions East Kilbride.